Zero Impact Guitars aka Casper Guitar Technologies is run by Florida based builder Stephen Casper. 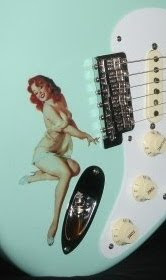 Our featured Strat-type is a custom for a soldier stationed in Afghanistan. I also wanted to feature something special in honor of National POW/MIA Recognition Day today. So, send your thoughts and prayers out for those missing or held captive & their families, as well as the rest of our brave men and women in uniform. Casper's 'Zero Impact' moniker comes from the fact that he uses all reclaimed wood (Smartwood), and runs his shop on solar/battery power. I discovered Stephen's guitars on Facebook where he posts a large variety of builds with beautiful inlay work, custom metal fabrication, imaginative finishes and a wide range of body styles. Whether you're a Strat fan, Tele fan, EVH body fan-- or even if you dig JEM-types (you should see his JEM projects! ), Casper has something for you. He's also into pairing guitar projects with classic cars as you'll see in some very cool FB photos.